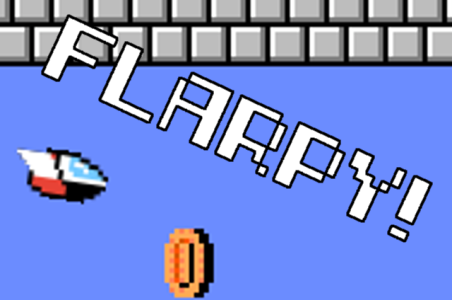 Testing out my HTML5 compiler with a game, Flarpy! It has been a long time since I wrote a game. This one just took me by surprise as I was playing Flappy Birds for the first time. Having heard that the author pulled it. I wanted to make my own version but different. Pulling from Super Mario Bros. and Flappy, I came up with this. I started writing it at work today and am now finishing up the levels. Hell, I even made a little title graphic. Well, it took me about a day to write the game but the levels are another thing. I will update the game as I finish the levels and hopefully someone, somewhere enjoys this game.